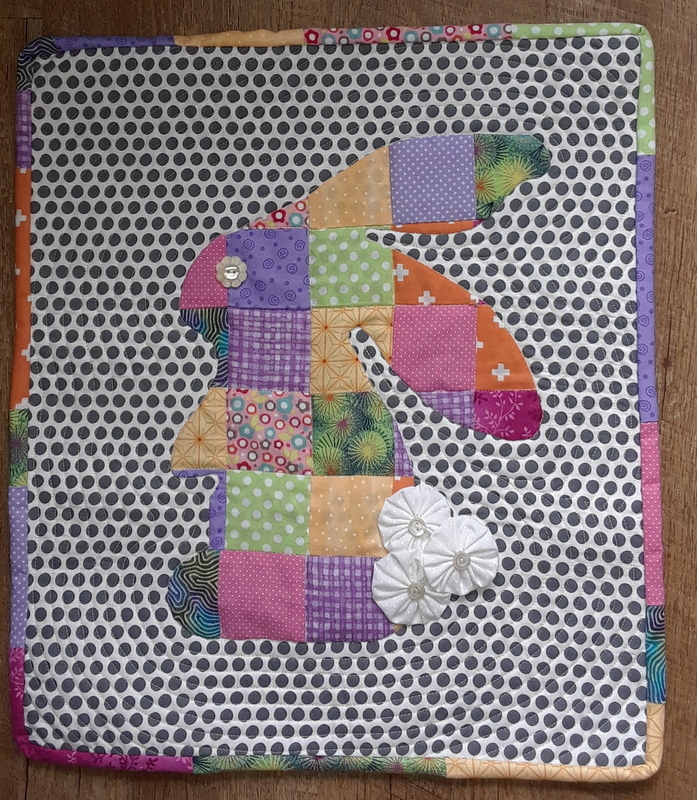 So, I finally got my sewing mojo on and made up this wee rabbit as a door hanging for Easter. 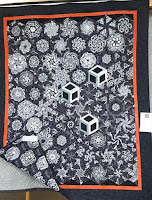 The pattern called for grey with white dots which of course I couldn't find, but think the white with grey dots work just fine :). 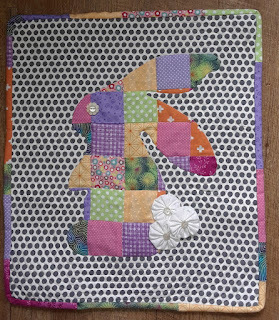 And the fluffy tail was supposed to be minky fabric, which I also did not have - of course, so I used YoYos. Luckily I found some buttons in the one and only button jar I still have so she has an eye ! My friend is returning my button jars to me today and of course I'll never need any more buttons once they're returned. Isn't that always the way? 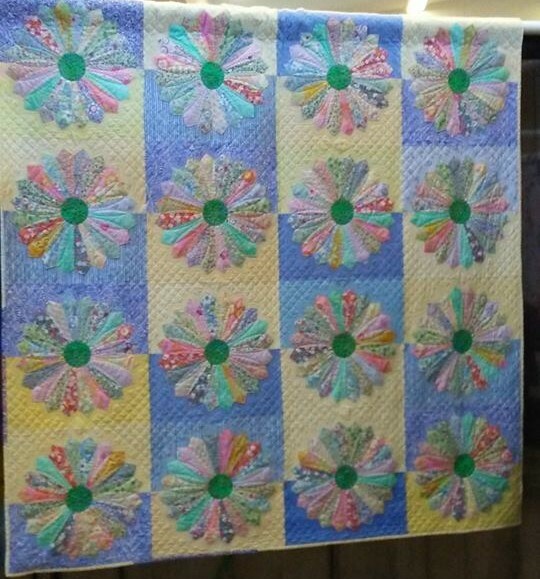 I used the leftover strips for the binding and overall am happy with the results. Looking forward to Easter and hopefully gathering with the family for a nice dinner and get together. Everyone is enjoying my April Showers hanging on my door right now. 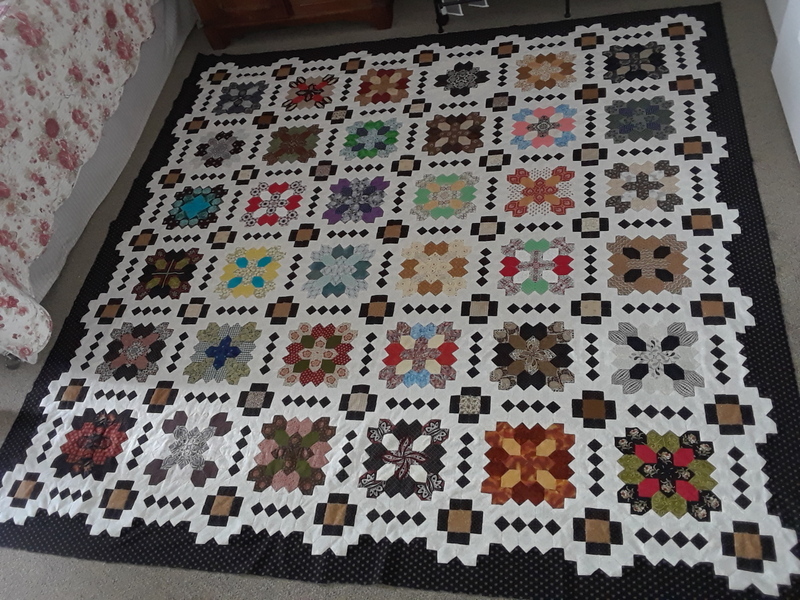 I made it a couple of years ago for mother. 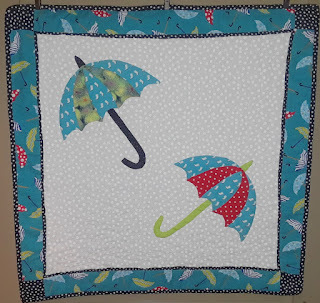 I fell in love with the umbrellas and rain boots fabric. I quilted rain drops but they don't show up very well on the dotty fabric. Never mind, it was fun to do . So, I have something for Valentine's on my door. It's smallish but does the trick and seems the ladies here at Oakcrossing like it. I've had several positive comments, which is always nice. Before my sister and her DH went off to sunnier climes for the month we had a family dinner to celebrate (2 weeks early) my great niece's 5th Bday. Of course I was unprepared so did the $ in a card method and suggested she and mommy enjoy some shopping. Well, looks like they did ! 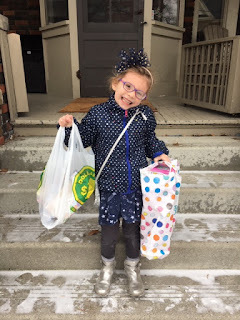 I'm told she got some stuffies, including a Unicorn. She looks happy doesn't she ! Glad to see Claire enjoyed her mini shopping spree :). 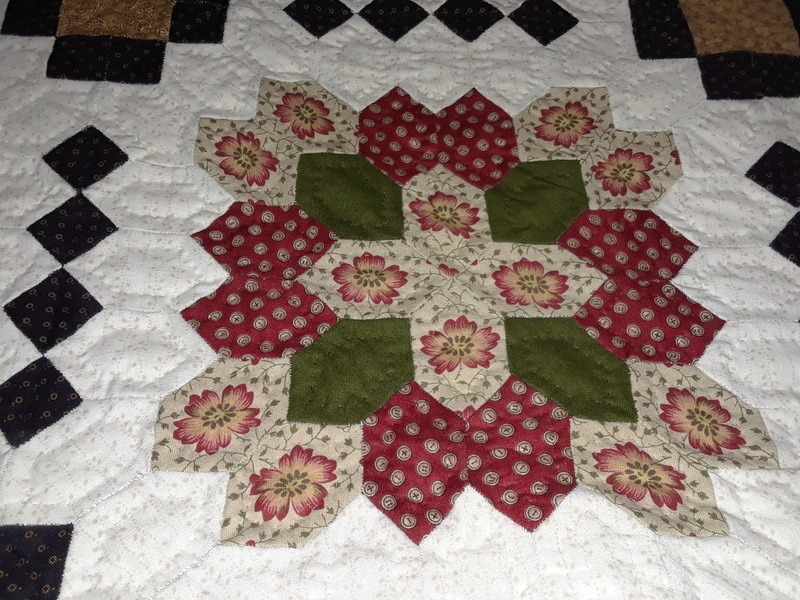 In the meantime I've been keeping busy hand quilting on my Lucy Boston. I'm about 1/3 done, but this week has been a bust as I've had the plaque for the last few days. Hope it's not the dreaded FLU - as that's what I had the last 2 winters, which hospitalized me and put me here @ Oakcrossing. DON'T NEED THAT AGAIN!! Happy holidays to all. It's been awhile since my last post. Indeed, I have been chastened about my indolence. 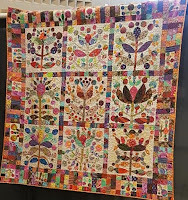 Well, in my defence (and there really is no defence) I've been somewhat busy getting my Lucy (Lucy Boston paper pieced Points of the Cross) quilt top together. 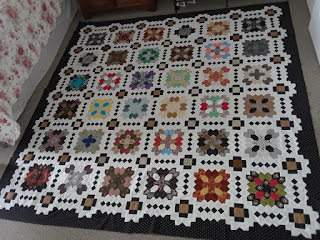 It's now together with borders, pic to follow soon as I finish getting the papers and basting removed. And, with the holidays and celebrations and gatherings of friends, etc., I just haven't had time for much else. That's my story and I'm sticking to it. 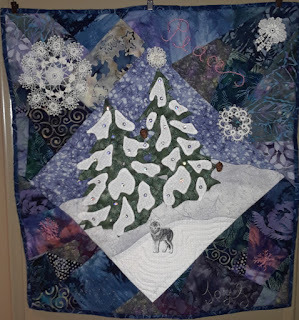 My time has been occupied, and I did manage to finish off 2 of my 3 retrieved Piecemaker's 2002 Seasons blocks - see December's block above. It's hard to see in this pic, but I embroidered Noel in copper thread in the bottom left corner, and in silver thread Joy in the bottom right corner. You can see the pink Peace in the top right. 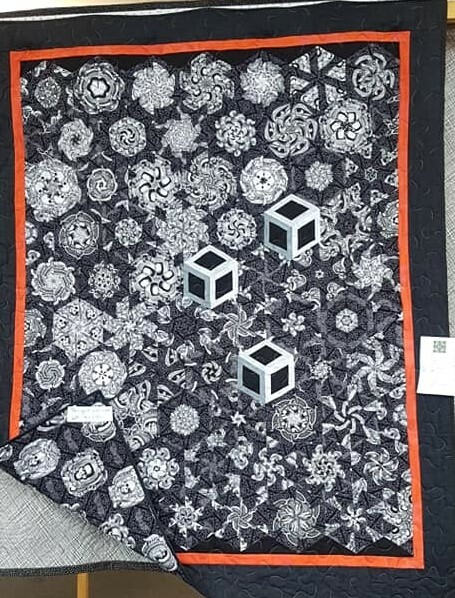 I also added a wee doilie (from grandma) and the only piece of Tatting I have ever done. 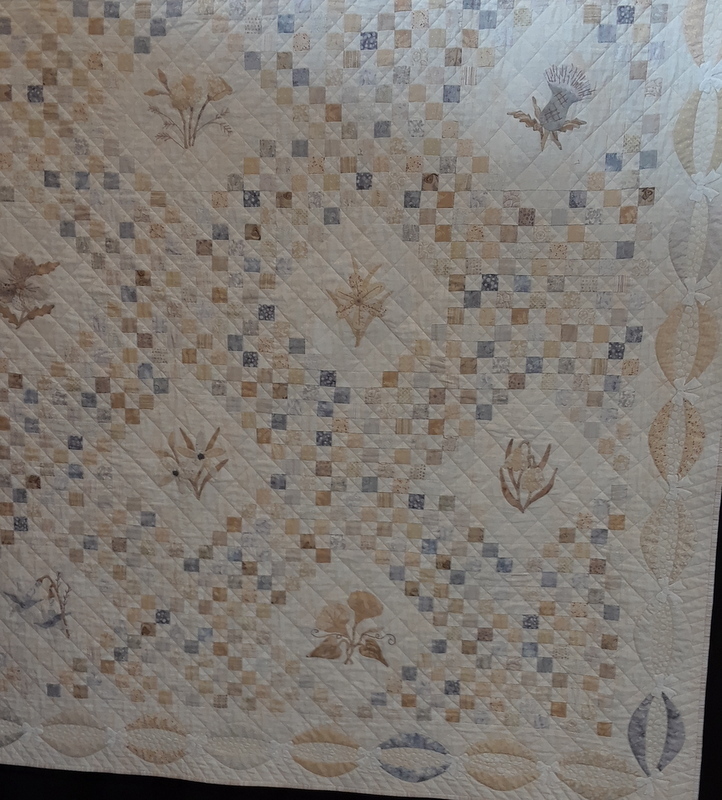 If you look carefully you will also see a couple of pine cone buttons, and of course the big bad wolf! 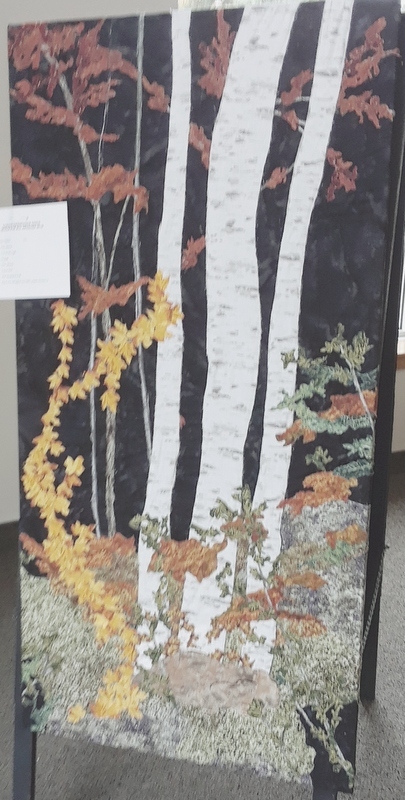 I like this one, and it has been a real hit here at Oak Crossing. So the next week or so will be busy sewing these two halves together. Then appliqueing the border on, finding my backing and making the big decision as to hand quilting or sending it out to be machine quilted. Which would you choose? 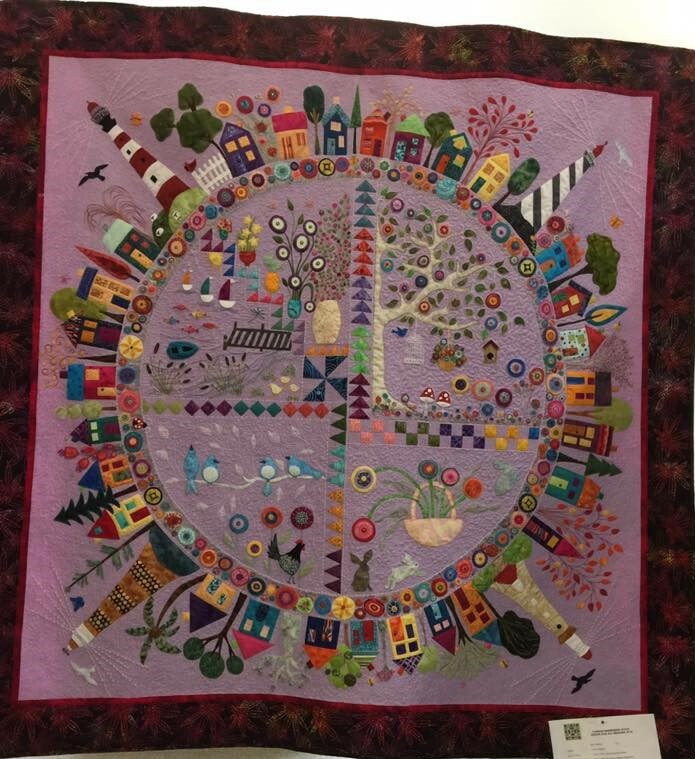 So this weekend was my guild's quilt show and I have to start off with this Canada 150 quilt made by Jacqui. 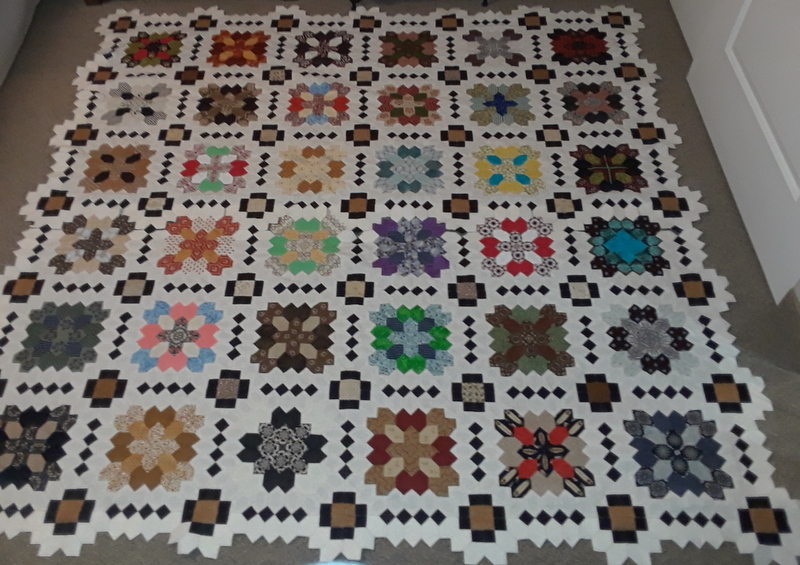 I've been wondering how I was going to put the blocks together on my version - sashing/no sashing/what colour, etc. I'm really liking her use of black, but think I may go for a dark charcoal rather than a true black. 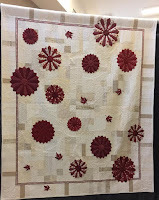 Lovely quilt Jacqui - thanks for the inspiration! Always loved this pattern of community in the round. Thought her use of background colour was interesting. Some more inspiration with the layout of this Dresden Plate - almost modern :). Uh huh - liking it! 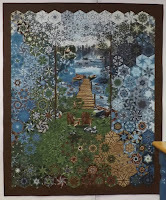 Lorna did a fabulous job with her Dresden layout also, and of course I love her use of colour, she's known for that talent ! 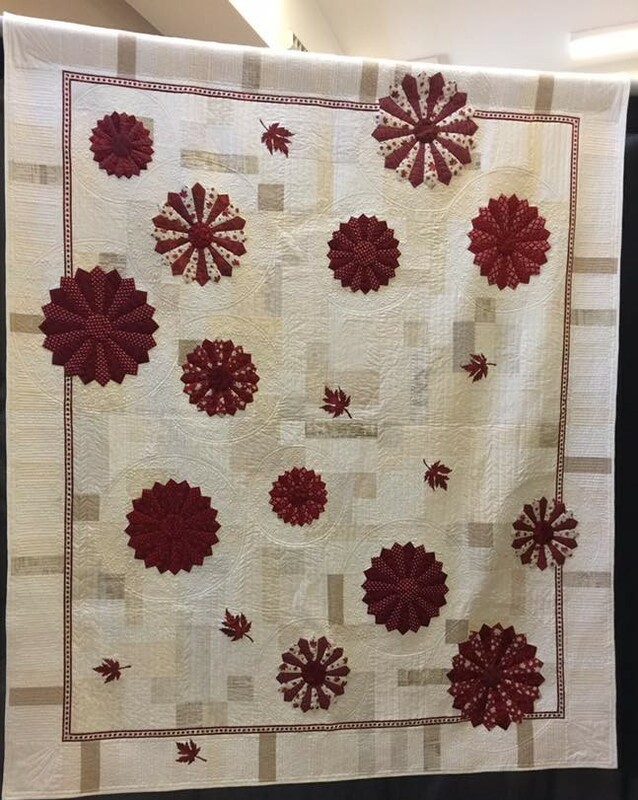 The white spokes in the plates are Canada 150 fabrics :). 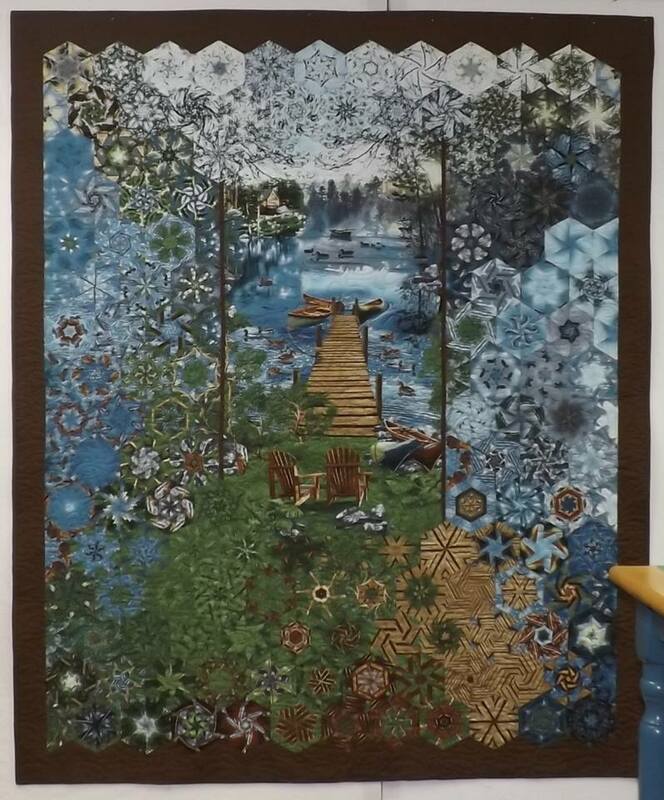 Here's another of Lorna's works (least I think it is her's) this time with hexies! Yowza!! 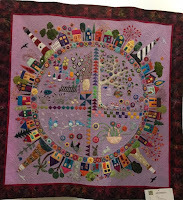 Another whimsical quilt - from Barb I think. Again, love the colours ! 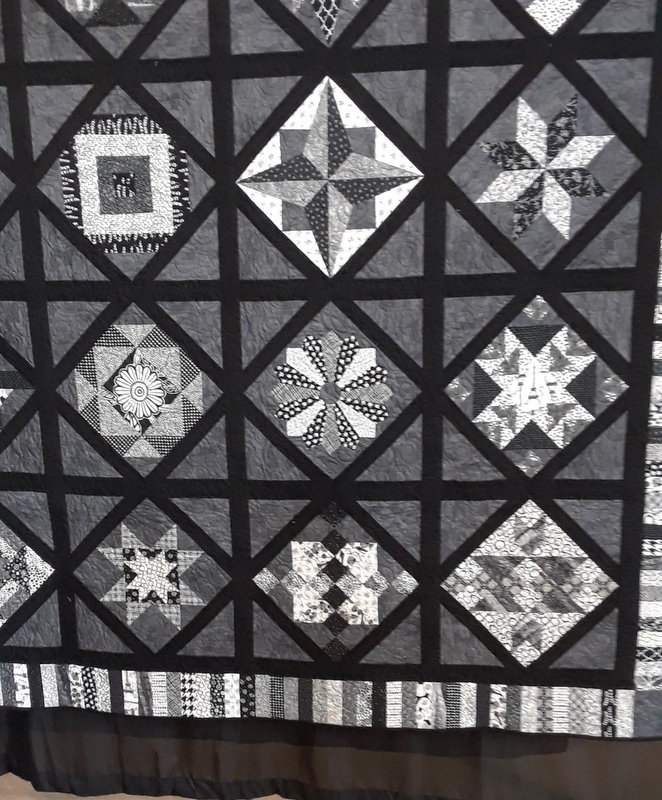 A B&W One Block Wonder. 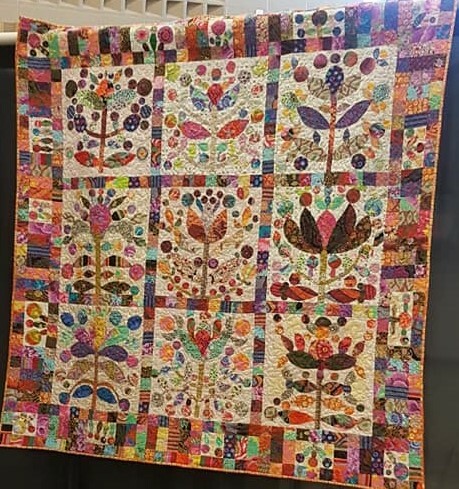 Geeze these are beautiful quilts, and the orange border really makes it pop! 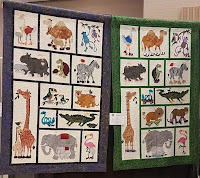 Not sure who's sampler quilt this is. 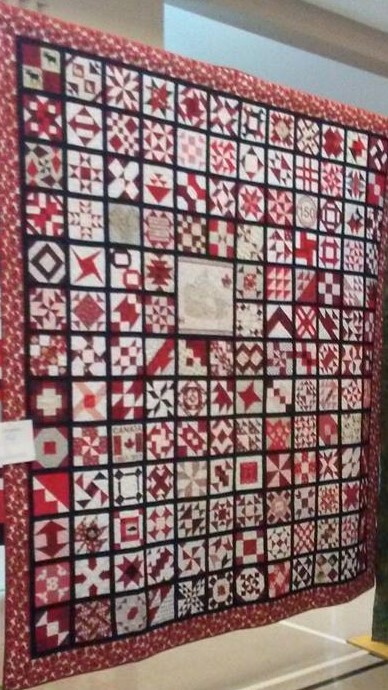 I usually don't like sampler quilts but thought this was an effective use of B&Wand love the piano key border! 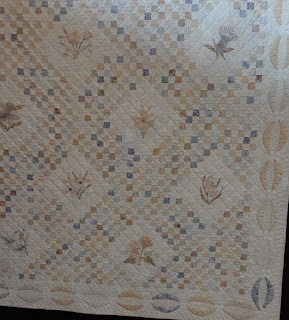 And rest your eyes on this lovely Taupe wonder by Linda. 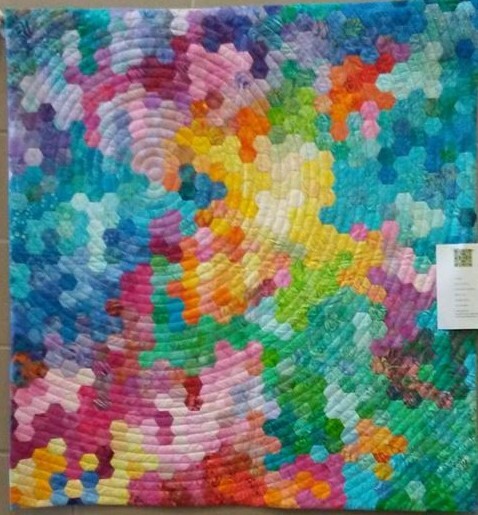 She's really into Yoko Saito's patterns and makes such gorgeous quilts! Must finish off with this beauty, one of three displayed at the show. This lady (sorry don't know her name, she's newish to the guild) does marvelous fabric art landscapes on board. 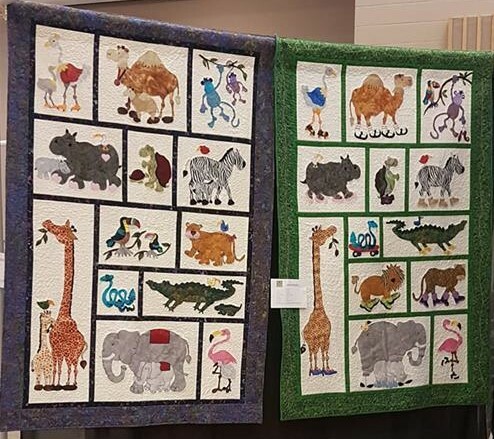 Hope you enjoyed a few of my picks from our LFQG's Quilts For All Seasons 2018 quilt show! 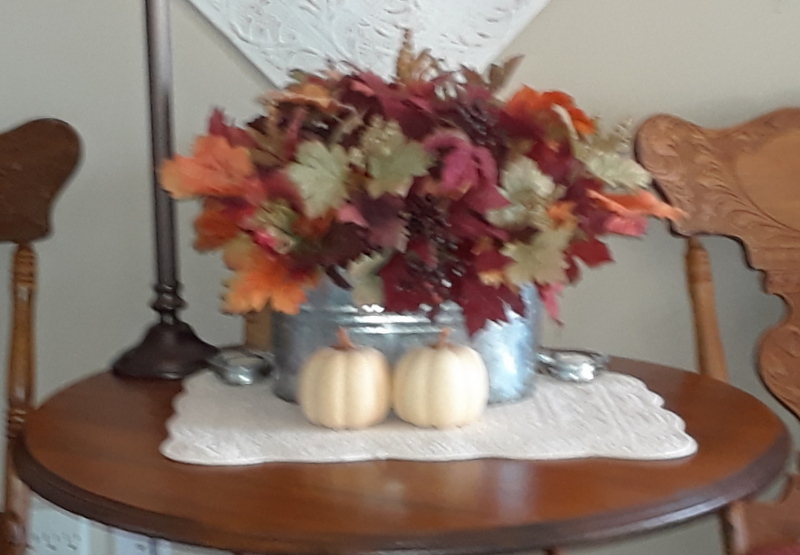 So I saved a few things from the old homestead, and glad I did as it makes a nice tablescape for the Fall. The leaves are starting to turn colours so I went for a wee drive this afternoon. Lovely to get out & about. 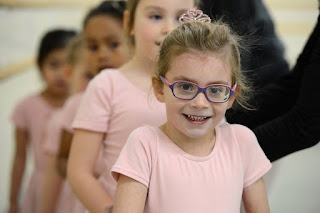 Lots of fun and activity since my last post. 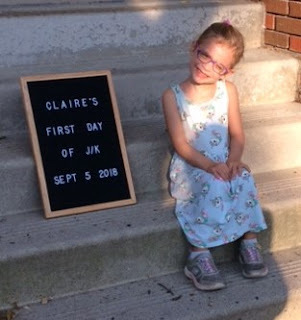 Claire has started school, and loves it! 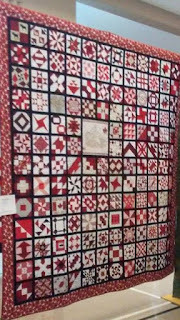 Thanksgiving has come and gone, but I missed the trip to Len's Mills and our evening guild meeting as I was not feeling the best. Have learned to take it very easy when my body tells me to :(. This week coming is William's 2nd birthday. 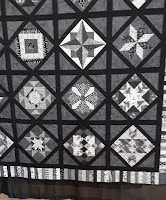 I promised myself I would start working on my Canada 150 quilt in Oct. Well, it's the middle of the month and I haven't opened the sewing machine yet ;(. Got to get myself in gear or it will never get done! 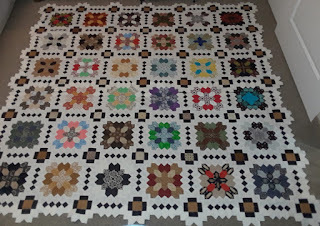 Ha ha ha, what can you do, although I admit to still be working on my Lucy Boston - the bottom half is now officially done, and I have just 3 connector blocks to finish the top. Then join the two halves and applique a border and it will be ready for quilting. Ohhhh, the end is in sight!